About 7 years ago, just when I had turned 13 on 22 April 2006 and had entered class 8th, I was very confused about a lot of things in my life… be it studies, friends, exams, this girl that I started liking in school, my parents, my passion for cricket, and soooo many other things. It felt as if everything was happening together in life and I was not able to do justice to anything. For example: let me explain to you about my friends v/s family situation - I have a lot of friends whom I love a lot and who mean the world to me. My friends have been the biggest pillars of support for me in my life. Every time I have felt low or confused or unhappy, my friends have always been there for me. Being with my friends makes me feel very happy. However, sometimes mom and dad do not understand why do I have to spend so much time with my friends. No matter how much I have tried to explain to them I feel they are somehow not able to understand my perspective. Similarly there was this confusion in my life about my love for cricket. I love playing cricket and I feel that I am a very good batsman. The most runs scored by me have been 86 runs at a run rate of 18.20. I know if I keep practicing then one day I can truly become an excellent cricketer. But attending many practice sessions for cricket resulted in my missing quite a many classes from school and tuitions. Because of this my studies started getting affected. It was really frustrating as I really wanted to balance everything out but was not able to do so. I was battling these confusions in life and getting more and more annoyed everyday with the smallest of things. I just didn’t know what to do and whom to talk to. I discussed my worries with my friends first but they too more or less seemed to be going through the exact same tensions and worries as I was. Though it felt light and good after having spoken with them but it did not give me any solution. Then I spoke with my parents but they advised me to let go of my cricket sessions for some time until I finish with my 10th boards and then I can resume my cricket practice once I enter 11th standard. This did not seem like a very feasible solution to me because cricket is not just a ‘hobby’ for me but it is rather a part of my personality. I couldn’t accept their solution and so I was left even more stressed and confused than ever before. Although none of my close friends had topped, but I had scored much less than all of them. With this confusion and stress in my life, I entered class 9th with a fresh resolve that this year I am going to strive much harder than before and make my parents and teachers proud of me. I was really determined that this time I am not going to let anything distract me nor let anything affect my performance. But it is easier said than done. I tried really hard in trying to understand class 9th maths but I just couldn’t figure any head or tail out of it. To top it all, my dad started telling me that he really wanted me take up engineering in IIT after school gets over. This was too much pressure for me to handle. To overcome this stress I started putting in more and more hours playing cricket as it made me feel really good. A friend advised me that I should stop worrying too much and just enjoy whatever I was doing at that moment then things would get better on their own. I followed my friends’ advice. It helped. But only for a short while! Initially everything felt good and easy as I had stopped caring about what others were saying or doing and I was just too focused in my own life and things. My whole class 9th went by like this – without much stress, no worries, and a total carefree and bindaas attitude. I liked it to the core. However, eventually, as time progressed, and as class 9th final exams came closer, I began to realize that though my carefree attitude had helped me stay away from stress, but it had not helped me understand my maths geometry and polynomials and probability and area and volume problems! I could see all my friends studying very hard and revising their syllabus while I could not even get a first level grasp at it. Stress came back into my life! It was around this time that my school organized a career counseling session. An organization called MapMyTalent had come to our school and had explained to us about what aptitude is and how knowing our aptitude can help us find the right career path and do well in our studies. Everything that they said made so much sense to me. They asked us to take few tests – Abilities Test, Aptitude Test, Personality Test, and Interest Test. They said that through these tests they will analyze what our personality is like and give us the best suited career advice. As I was taking that test I realized a lot of things about myself. They even conducted a counseling session with all parents to address their queries as well. It was really nice to see someone talking to my parents through my perspective and sharing my thought process. All the parents seemed very happy and convinced after that session. After about 20 days of having taken that aptitude and personality test, I received a mail which contained the report on the analysis of my test. It explained to me various things about what my aptitude is like, what my personality is like, what are my interests and they even advised me the 3 most best suited career options for me (engineering was not one of them). Everything that the report said made so much sense. It was explained so well and I could completely relate to it. Even my parents felt convinced about my key strengths through that report. The report even told what my weaknesses are and gave me some tips on how I can work on them to enhance my personality. I applied these tips in understanding the concepts of maths and science and I was able to not only understand these subjects much better than ever before but also better concentrate in my subjects and balance my cricket, friends, studies and family well together. So this is my story so far. There's a lot more to be shared which I will do in other blogs. 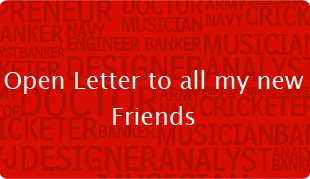 I am writing to you to make new friends through MapMyTalent who are going through the same problem as I was before. If you have been facing the same dilemma as me, then let me know… the experts at MapMyTalent are my good friends now and I would be glad to send your message across to them and tell them to help you out with your problems. Let me know what you feel.